In the 1930s, a millionaire (Burt Reynolds) falls for a singer named Kitty (Madeleine Kahn), but is snatched away by Kitty’s indigent-heiress friend, Brooke (Cybill Shepherd). Meanwhile, a suave Italian gambler named Johnny Spanish (Duilio Del Prete) is in love with Brooke, Kitty is in love with Johnny, and Reynolds longs for his original love, Kitty. Peter Bogdanovich’s much-maligned Cole Porter musical — infamously shot with his actors singing live rather than lip-syncing — is a surprisingly enjoyable, albeit innocuous, treat. Most of the critical complaints come from those who argue that Cybill Shepherd and Burt Reynolds are woefully miscast, and can’t carry a tune in a bucket — but this isn’t quite true. While Shepherd is no Marnie Nixon (and it IS hard to believe she actually released an album of Porter songs the year before), she has a sweet, warbling voice which only occasionally lacks the necessary punch. Reynolds, for his part, is never asked to do any major singing, and manages to pull off his role with characteristic macho flare. (If we really want to start nitpicking actors in musicals who couldn’t sing, why isn’t Rex Harrison in My Fair Lady torn to shreds?). Ironically, while Madeleine Kahn is a marvelous comedic actress, her unusual voice seems least suited for this type of musical. It’s relative-unknown Duilio Del Prete who most evokes what we think of when we remember 1930s musicals — he’s perfectly cast here, and sings very nicely. 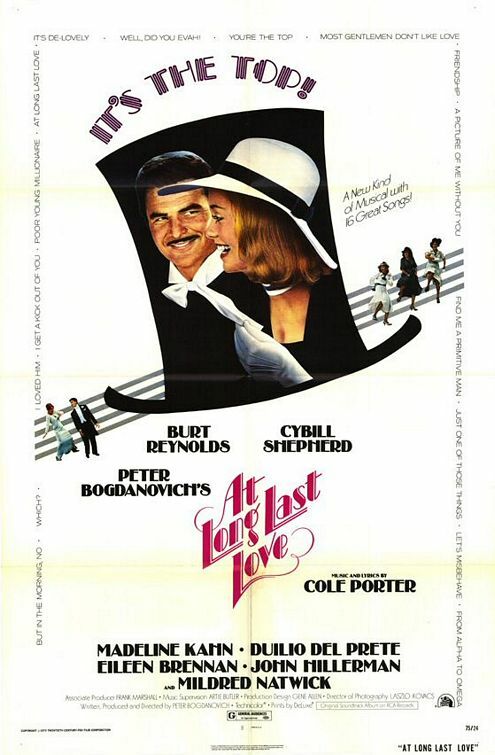 Music aside, the plot of At Long Last Love is a clever, suitably frothy romantic comedy, one which impressively integrates the lyrics from many of Porter’s best songs into a seamless narrative. Apart from its oddly inconclusive ending, there’s not much to complain about story-wise here. And visually, the film is quite a treat, with sumptuous art deco sets and beautiful gowns. Perhaps I’m missing something — or perhaps time has been incredibly kind to Bogdanovich’s vision — but I don’t get this film’s negative rap. Yes, simply for its notoriety — but chances are you’ll enjoy it a lot more than you think. Listed as a camp classic in the back of Peary’s book. Since it’s recommended as a must here for its “notoriety”, I’ll concur on that basis. That said, mine is not completely enthusiastic agreement – for a number of reasons stated in the assessment, and a few of my own. Although the cast is game as all get-out – and Bogdanovich has done a marvelous job at getting everyone to relax and let fly – the movie itself doesn’t become the celebratory souffle it’s meant to be. While watching, I keep wanting to like it more than I really do. The only other project of this type that I can think to compare ‘ALLL’ with would be Scorsese’s ‘New York, New York’. Both films set out to nostalgically capture definite NYC periods and eras of music. However, ‘NY,NY’ seems much less self-conscious, somehow less labored. And Scorsese had at least one terrific singer (Minnelli) on board. Isolated moments are rather memorable: Reynolds is adorable when he parodies jealousy; Kahn gets some Kahn-esque moments (I love when Del Prete advises the two of them make the other couple jealous and her reply is, “Do we rehearse?”); Del Prete tends to be a honey to watch. But overall, I think Brennan steals the picture. I’m not as fond of ‘But In The Morning, No’ (though Porter’s lyrics are hilarious on a second level). If I had to pick a favorite musical scene, it’s when Brennan leads the other ladies into ‘Most Gentlemen Don’t Like Love’. The three of them really seem to be having particular fun. Chances are I’d watch this one every once in a while. I wonder what Porter would have made of it; my guess is, all things considered, he may have been forgiving.